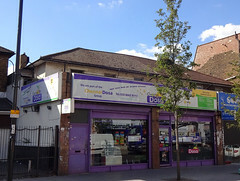 Casual cafe-style South Indian restaurant in West Croydon, part of a small chain with half a dozen branches around London. They also do takeaway and delivery, with online ordering via Just Eat. It's on two levels, with seating for 20 or so diners on the lower level and another 50 on the upper. The lower level is also home to the buffet station, used at lunchtimes and for weekend breakfasts. Chairs are black pleather, floor tiles and tabletops are polished variegated grey, and walls are papered in a fake-stonework design. Signs around the walls urge diners to eat with fingers rather than cutlery, and a hand-washing station sits in one corner of the upper seating area. According to the menu as of August 2018, all the food is halal. Around half the menu is vegetarian, and a reasonable amount is also vegan, all clearly marked (the vegetarian via separate menu sections and the vegan with "D" and "E" for presence of dairy and eggs respectively; in addition, egg-containing items are not considered to be vegetarian). Kake has visited several times now, for both weekend breakfast and weekday lunch, both alone and in the company of others including Bec and Sarah. On Saturday mornings in July and August 2018, we were among the first customers when arriving at their opening time of 10:30am, and it didn't take long for the place to be about half-full. On a Tuesday lunchtime in September 2018, there were around half a dozen other customers when Kake arrived around 1:30pm. On our lunchtime visit, music was playing, not too loud. In July and August 2018 we had the breakfast buffet (£6) photo of one of our plates, which is only available 10:30am-noon on Saturdays and Sundays. This included dal, pongal, uppma, sambal, coconut chutney, vadai, idli, puris, and dosas (the latter cooked fresh to order; the rest kept warm on the buffet). It was all up to standard both times, except that on our August visit the dosas were poor; limp and greasy. Gobi 65 (£4 in Sep 2018) photo was crisp and greaseless, and nicely seasoned even without the hot, fruity chilli sauce provided on the side. Some of the pieces were a little too large to be eaten in one bite, and perhaps overall the cauliflower could have done with being cooked a little more, but these are minor criticisms. Tomato utthappam (£3.25 in Sep 2018) photo initially did look a bit greasy, but was actually fine, and they'd got some nice crispiness on the underside without overcooking it. The wetness of the tomatoes was well-controlled. Sambar and chutneys on the side were fine albeit nothing special. Masala tea (£1.60 in Sep 2018) was good, with well-balanced spicing, just the right amount of creamy milk, and not pre-sweetened (though be warned that on our breakfast buffet visit it was sweetened, and far too much so for our taste). Child-friendliness: As is usual in Indian establishments aimed at actual Indian people, children are welcome. They have several children's menu items, including chocolate dosas. Accessibility: A small step to get in (only about an inch, but more steps (with handrail) to toilets, handwash area, and upper seating level. Last visited by Kake, September 2018. Last edited 2018-12-28 16:37:42 (version 3; diff). List all versions. Page last edited 2018-12-28 16:37:42 (version 3).